St. Thomas, U.S. Virgin Islands - The U.S. Virgin Islands Economic Development Authority (USVIEDA) announced Mr. Kamal I. Latham, MPP as the new Chief Executive Officer (CEO), following an international search by the PACE Group. Latham has helped facilitate over $5 billion in economic growth throughout his nearly 20 years of combined experience as a non-profit executive, entrepreneur, Fortune 500 adviser, U.S. diplomat, and Wall Street financial analyst. The USVIEDA Board, worked hand-in-hand with The Pace Group, a leading international executive search firm specializing in economic development. A top-notch pool of candidates was developed, and five finalists were interviewed by the Search Committee. Latham advanced numerous successful initiatives during his career including facilitating over 70 business growth recommendations being adopted by local governments in Florida, designing a strategy resulting in millions of dollars in new revenue for a Fortune 500 company, helping negotiate a multi-billion dollar trade deal between the United States and China, securing European support for a multi-million dollar Middle East/North Africa investment program, and helping raise approximately one billion dollars in debt and equity capital for corporations. “I am humbled and honored to have been chosen by the governing board to lead the U.S. Virgin Islands Economic Development Authority and work with its gifted staff. It is an impressive organization with a great mission and reputation,” said Latham. “I am excited about partnering with stakeholders from the government, business, non-profit, education, civic, arts, and other sectors to leverage existing assets and further realize the Territory’s potential,” added Latham. Born and raised in New York City, Latham earned a Master in Public Policy degree from Harvard University and a Bachelor of Arts degree in political science and history from Temple University. He has lived and worked in North America, Europe, and Asia. Latham is a two-time recipient of the U.S. Department of State’s Meritorious Honor Award for his role in brokering bilateral trade agreements. He and his wife Jonnel have a son and daughter. “The U.S. Virgin Islands has a rich cultural heritage with an industrious and talented workforce. I am passionate about public service and look forward to facilitating job creation and economic opportunity Territory-wide,” commented Latham. 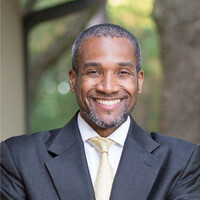 The USVIEDA CEO will spearhead efforts promoting economic development in the U.S. Virgin Islands by developing and implementing a comprehensive economic development program focused on business expansion and recruitment, small business incubation, business financing, industrial park development, neighborhood revitalization, and marketing. The U.S. Virgin Islands Economic Development Authority is a semiautonomous government organization responsible for developing, promoting and enhancing the economy of the U.S. Virgin Islands. The USVIEDA is the umbrella organization under one governing board which assumes, integrates, and unifies the functions of the following subsidiary entities: the Economic Development Commission, the Enterprise Zone Commission, the Economic Development Bank, and the Economic Development Park Corporation. For more information visit www.usvieda.org.